Number Frames, by the Math Learning Center | Clarity Innovations, Inc. Number Frames help students structure numbers to five, ten, twenty, and one hundred. Students use the frames to count, represent, compare, and compute with numbers in a particular range. The frames help students see quantities as equal groups of other quantities and in relation to benchmark quantities. This helps primary students move away from one-by-one counting toward more efficient ways of counting and computing. As students advance, custom frames can be constructed to help visualize factors, products, fractional parts and more. 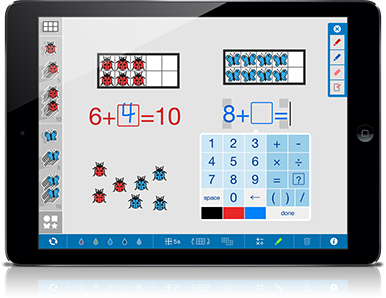 For more information about Number Frames and other apps, visit: www.mathlearningcenter.org/apps .